Education programs (Fall/Spring): If you’re looking for an impactful, meaningful internship, you might be a great fit for our Mobile River Program or Redbud Field-Trip Program. As an intern, your primary duty is to deliver fun, informative lessons to students. The Redbud Program takes place outside, on the grounds of LCRA’s Wilkerson Center for Colorado River Education in West Austin. The Mobile River Program moves around the city, visiting middle schools with its amazing science-center-on-wheels. 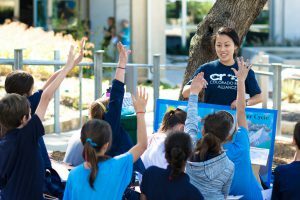 Hands-on activities in both programs educate students about water science, groundwater, urban watersheds, water quality, river stewardship, and water conservation. You’ll also have other duties that are essential to running a high-quality program, such as preparing program materials and logging the evaluation data. No experience necessary! This is an opportunity for anyone who enjoys interacting with young people. We are especially interested in interns who are fluent in both English and Spanish, but Spanish proficiency is not a requirement for our education interns. Our training and mentoring provide you with all the skills and materials that you need to become an excellent “docent.” Program hours for Redbud: Tuesday – Friday during regular business hours, typically 8:30-1:30. Program hours for the Mobile River: Monday – Friday during regular business hours, typically 8:30-4:00. Students who successfully complete their internships in our education programs are eligible for a $250 stipend at the end of the semester. Communications and Development: These internships have more flexible hours (though still mostly during business hours) and focus on skill-building and gaining professional experience in the areas of public relations, social media, fundraising campaigns, and special events. Click here for full position description! For more information, please contact Melissa Miller, Executive Director, at melissa@coloradoriver.org or 512-498-1587.